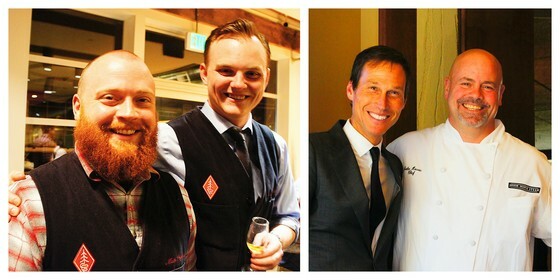 Left to right: Matt Hofman and Emerson Lamb at Westland Distillery; Erik Liedholm and John Howie of Wildwood Spirits. The biggest of the newcomers, and most ambitiouis, is Westland, At 60,000 gallons a year, it's the largest malt whiskey distillery (by volume) west of the Mississippi. And its owners are only 24 years old. The other novice is Wildwood Spirits, an about-to-blossom project from Erik Liedholm, the cerebral sommelier at Seastar, with support from chef John Howie. Their first efforts, distilled in Michigan, have won plenty of admiration from colleagues. The story of Westland Distillery starts among the giant trees of Grays Harbor County on Washington's west coast, where Douglas fir, spruce, alder, cedar, and hemlock grow tall and moss-covered on Federal forestland, bathed in the cold, moist air of the Pacific Ocean. In that respect, Hoquiam and its neighboring towns, Aberdeen and Cosmopolis, are almost like the waterside communities of Scotland, but that's getting ahead of the story. Here, at the turn of the last century, a young Stanford grad named Frank Lamb crossed paths and fell in love with the daughter of George Emerson, a sawmill manager in Hoquiam. Lamb started a company to design and manufacture logging and milling equipment, moved into papermaking, and was instrumental in developing the Port of Grays Harbor; his son, David, began exporting the machines to Scandinavia, which also has abundant forests. But David's son, named Emerson Lamb, became interested in something quite different. Not yet 20, he approached a classmate from Bellarmine Preperatory Academy in Tacoma, Matt Hofman, with a business plan to distill malt whiskey. Hofman dropped out of the University of Washington to sign on, and the two friends set out for Scotland. "We weren't old enough to drink in the States," is how Lamb put it. They raised money from family and friends, and leased a couple of buildings in South Park to get started. They decided to make their own mash rather than purchasing from a local brewery like Elysian (as Copperworks Distillery does). Their grain would come from the Skagit Valley, their water from the Cedar River. Because they wanted a uniquely American product, a uniquely Northwest whisky, they also decided not to hire a Scottish master distiller. Their 55-gallon casks are heavy-toast, low-char, made from American oak by the Independent Stave Company of Lebanon, Missouri. The whiskey ages for 27 months at a rack house in Hoquiam, where the air is colder and moister (which significantly reduces expensive evaporation) and extracts the sugars from the wood. The process also oxidizes the whiskey, and develops the unique esters of a mature Scotch. Outsiders may have been surprised, but Lamb was modest about his most recent success: a double gold medal and Best of Class citation at the San Francisco International Spirits Competition for Westland's Flagship Single Malt. Liedholm grew up on Wildwood Street in East Lansing, Michigan, where his parents were both on the faculty of Michigan State University. He found his way into wine and was recruited to into John Howie's fold. "I have no real experience as a distiller," Liedholm admits, but he did know about Kris Burglund, a biochemist at MSU who's considered the expert's expert. Five years ago, on a trip to Portugal, Liedholm bought a nine-liter copper still and promptly made a batch of grappa from petit verdot grapes that he sourced from the Ciel du Cheval vineyard. Add homemade grappa to the Beardslee project, yes! Use the best red winter wheat from TriState Seed, yes! Ship 15,000 pounds of the wheat to Prof. Burglund, yes! Learn the elements of making beer and turning it into vodka (saccharification, fermentation and distillation), yes! Get your equipment from the master, CARL. And because vodka is essentially the tofu of the spirit world (colorless, odorless, virtually flavorless), use that vodka to make your gin. Use a dozen or more botanicals. Wildwood's vodka is known as Stark Vatten, "strong water" in Swedish. The gin is called Kur, pronounced "cure." It's so good it will convert folks who think they don't like gin. "We think there's room at the top end, and for spirits made with Washington products," says Chef Howie. "It's a step into a whole new arena." There's a bit more work to be done at Beardslee before the brewpub opens (you can follow the progress here). The original shipment of gin and vodka, for its part, is being held up by red tape and paperwork (no surprise). When it does reach Seattle, the shelf price will be well under $30. Next year, Wildwood should produce 2,000 cases, and after that, it's just a question of demand. As for Liedholm, one more exam and he can add "Master Distiller" to his resumé. This page contains a single entry by Cornichon published on May 3, 2014 11:30 AM. Eating with a Grown-up Urbanspoon was the previous entry in this blog. Kate Lindsey steals the show at McCaw Hall is the next entry in this blog.